March | 2014 | Frank & Donnis Travel Blog "the more we see the more there is to see"
Donnis finished her night shift last night. It was the last shift of her contract. Within an hour she had left Collarenebri and was on her way home. 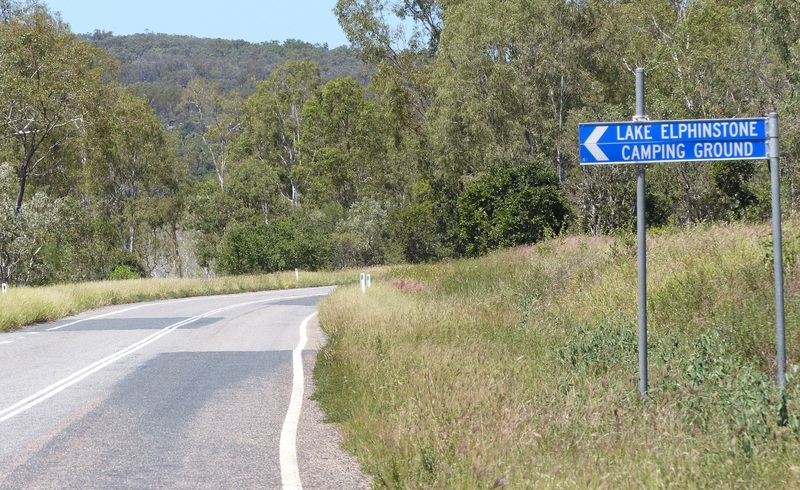 Although she stopped a few times for a rest and refreshment she was still able to make it to Miles in Queensland. That was a trip of around 500 Klms. She booked into a motel…the same motel I stayed at when I drove to see her at Christmas. Although she left in fine weather it soon became overcast. 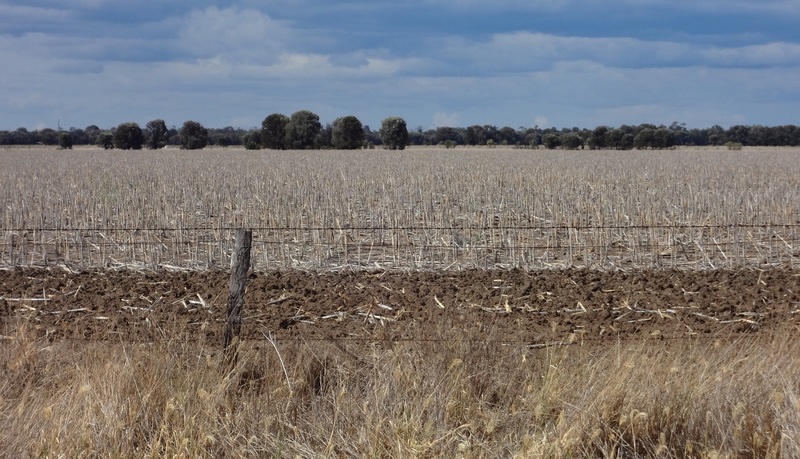 Dry parched paddocks somewhere along the Leichhardt Highway in Queensland. The welcome gathering storm along the Leichhardt Highway. 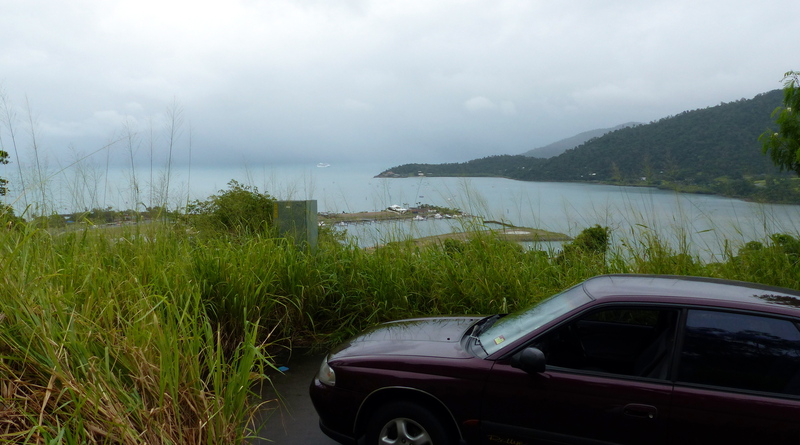 Meanwhile back in Airlie Beach, heavy, consistent, persistent rain began. Donnis arrived home at 8pm and the real heavy rain began. Donnis slept in…as well she should after a marathon drive yesterday. In the afternoon we started looking at items in the garage and talked about our plans for the future. At the moment there is no plan. In the afternoon we started to pull items out of the garage and cleaning them. Family photos, paintings and prints were cleaned put up on the walls. Hmmm! When I was here by myself the bare walls did not bother me. In fact I quite enjoyed the barrenness. Suddenly Donnis is home and all those walls are now adorned as they were before we left. Since we moved into this house all those years ago we have had a Cadagi Gum tree on the block next door. Right on the boundary line. Its branches hang high over our house. 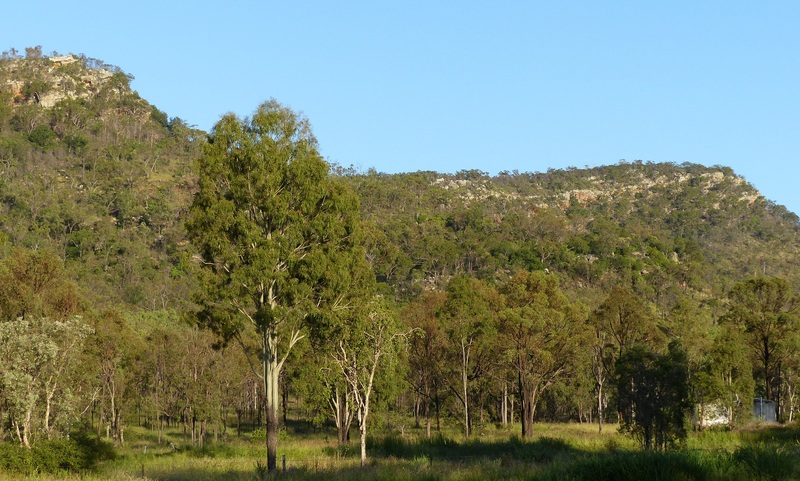 The Cadagi is a eucalypt tree native to North Queensland. I consider them a dirty tree , certainly compared to other eucalypts they drop their gum resin which makes the ground and in our case our roof, black with the resinous droppings. In other states the tree is classified as a weed. Bees love the seeds but the seeds are sweet and sticky. The bees take the seeds back to the hive and the entrances become clogged. So it was that we took turns up on the roof with the Gerni Water Blaster with a bottle of CT18 ( a heavy duty truck wash detergent) loaded into the nozzle. It was heavy slow work but we could see an improvement and the green roof under the black resin re-appeared once more. But it’s a big roof, hard dangerous work and the hot sun sapped the energy out of us. In the afternoon and the shade of trees at the side of the garage I got the chain saw active and cut down two??? trees which had grown from a bird dropping which had contained seeds. Later we moved some small furniture items onto the verandah and vacuumed and washed them before giving them a dose of furniture polish. Whew! It was a long tiring day and we both fell asleep watching a movie on TV. More of the same. Up on the roof until the heat drove us down to shade again. This job is bigger than Ben Hur. 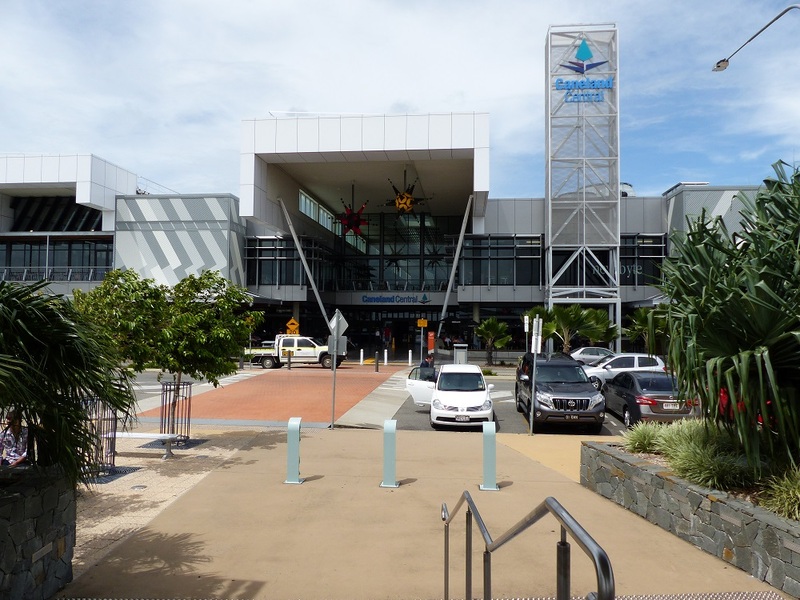 In the afternoon we visited the new Woolworths store which opened in Airlie Beach yesterday. We picked up a few groceries and two bottles of wine then visited Port of Airlie for a few minutes before having soup for dinner and falling asleep in front of the TV. Hmm! A pattern seems to be developing here! I had a vague plan of driving to Hideaway Bay then a quick lunch and a beer at Dingo Beach. An easy relaxed Sunday. 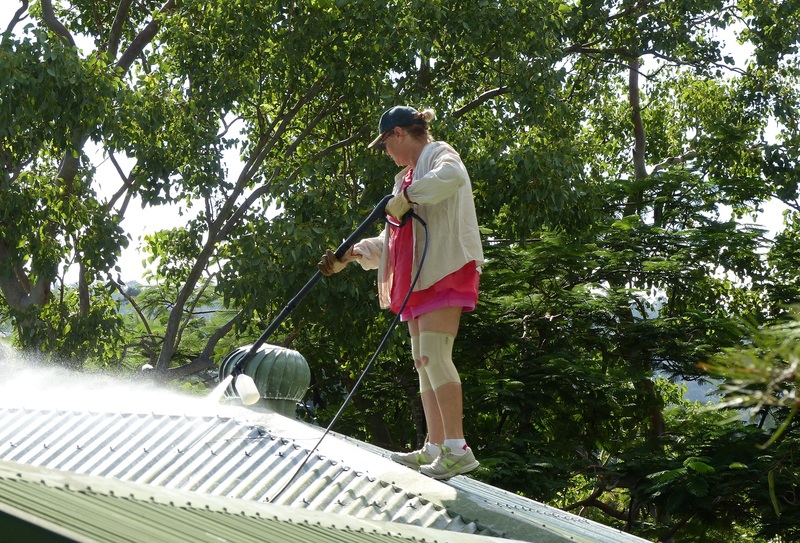 By 8am we were up on the roof cleaning the muck and clearing the gutters which were once again filled with leaves. Donnis doing the Gerni Waltz on our roof. 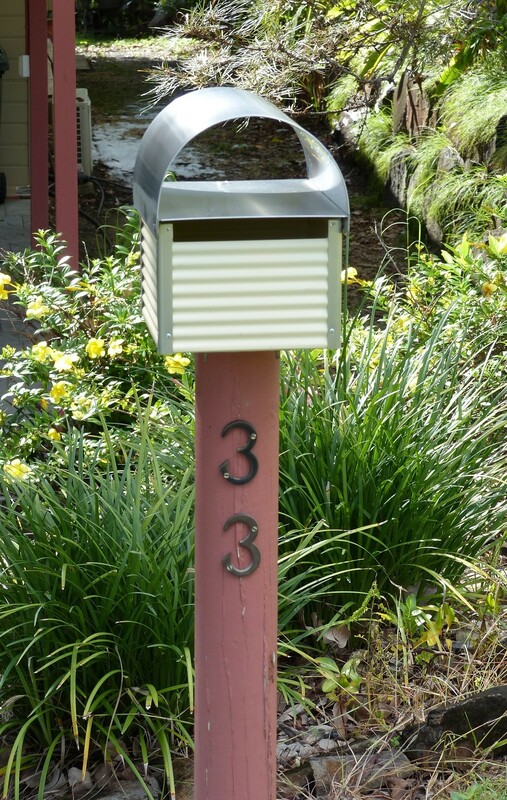 Our new letterbox with profusion of yellow flowers in the background. It was a hot sunny day and as has been the case since Friday, very humid. We repeated yesterday by emptying a few more boxes and a couple of pieces of furniture and throwing out stuff we have not needed or used in the last three years. At lunch time I had a cold beer and watched the movie, 12 years a Slave. It shows how men and women can be so cruel to each other and people of a different race, colour, creed or religion. Tonight, tired but happy that we have achieved something we are relaxing in front of the TV. Umm err perchance to fall asleep? Tra la la. Another day of sunshine. I spoke too soon about the sunshine. Tropical Cyclone HADI which threatened the coast last week did a U-Tuen and headed back to sea. Whew! Dodged a bullet was the local reaction until today. HADI had turned back into a tropical low and had done another U-Turn and was heading back to the coast. Tropical lows bring wind and rain. Lots of it. By the afternoon the lovely sunny day was turning overcast and the wind was gusting at times. Patches of rain during the day and heavier at night. Strong wind becoming more consistent and persistent. Plenty of rain overnight and the roof gutter near the front door overflowed. Oops. We did not clean the leaves out of that part of the gutter last month. Wind became stronger during the night and rain was bashing against some windows. Luckily I can close windows on the windward side of the house and open windows on the lee side. In fact under normal conditions all windows and doors are open – day and night. The ex-tropical cyclone HADI, now a tropical low has moved further up the coast and will likely cross the coast somewhere in the far north and not cause destruction but may bring welcome rain into parts of the outback. Heavy rain fell in the afternoon and night but the winds have all but gone. In the morning I drove to Mt.Whitsunday to photograph a cruise liner anchored out in Pioneer Bay. The camera had trouble focusing as the cloud cover, heavy rain coming in from the sea and the water were all much the same colour. A sort of gray black. In the photo it is difficult to see where sky ends and ocean begins. A cruise ship can be seen in the middle and slightly to the left. In the foreground is The Port of Airlie a recent marina development. 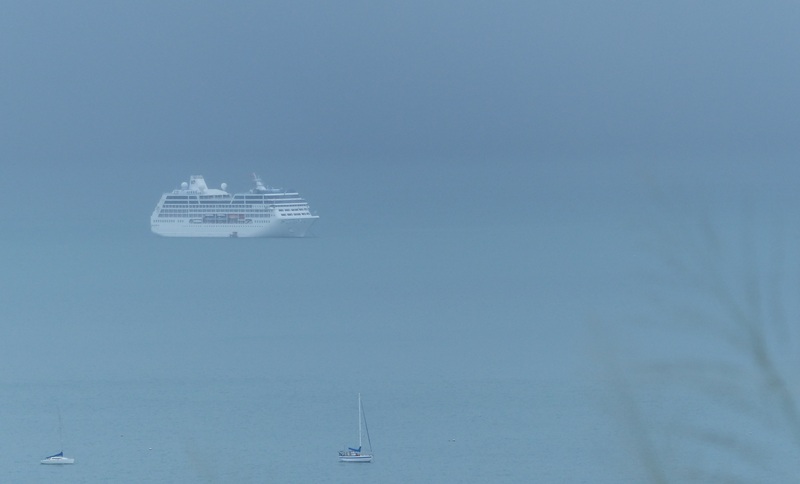 The cruise ship is difficult to see as low cloud and a rain front is heading towards the bay. Donnis will complete here final shift on Sunday… a night shift. She is undecided whether to begin her trip home Monday morning or stay another night to rest up before leaving on Tuesday. Plan B is to leave Monday morning but only travel as far as Goondiwindi just over the border in Qld, a distance of about 300 Klms and she can stay the night in a motel. Most of the wind and rain has gone although some heavy falls in the early morning but the sun made a welcome visit a few times in the day. I did some weeding and took down some old cheap fencing while the ground is still soft and while the rain had stopped…temporarily. RALLYE would not start so I called RACQ. When the Roadside service man arrived he turned the ignition key and the motor started effortlessly as it usually does. WOT THE? He did a battery test and decided the terminals were a bit dirty so he cleaned them up but commented about the msll and sight of some blue smoke. There was some oily residue on the engine block and exhaust. Not fresh oil but a gritty residue. While I was in a fixit mood I sprayed with degreaser and 5 minutes later hit it with the GERNI water blaster on low setting. Wow! That cleaned the engine in a hurry. I climbed on the garage roof with the chainsaw. Yeah, yeah I know- it’s dangerous. I agree. I had cut the last overhanging branch and stepped onto a part of the roof which was still damp and it was like my old ice skating days. I dropped the chainsaw like a hot potato and crouched to keep my centre of gravity low, scrabbling with my fingertips trying to find a few roofing screws to hang onto. I did. Luckily I had finished the job so packed away the chainsaw and ladder etc and decided the house roof no longer needs cleaning with the GERNI. I told myself the heavy rain had done the job for me. I found an easier job which needed doing inside the house. I ironed my work-shirts… Well, somebody’s gotta do it. While ironing I could hear a squawk, somewhat like an injured bird. 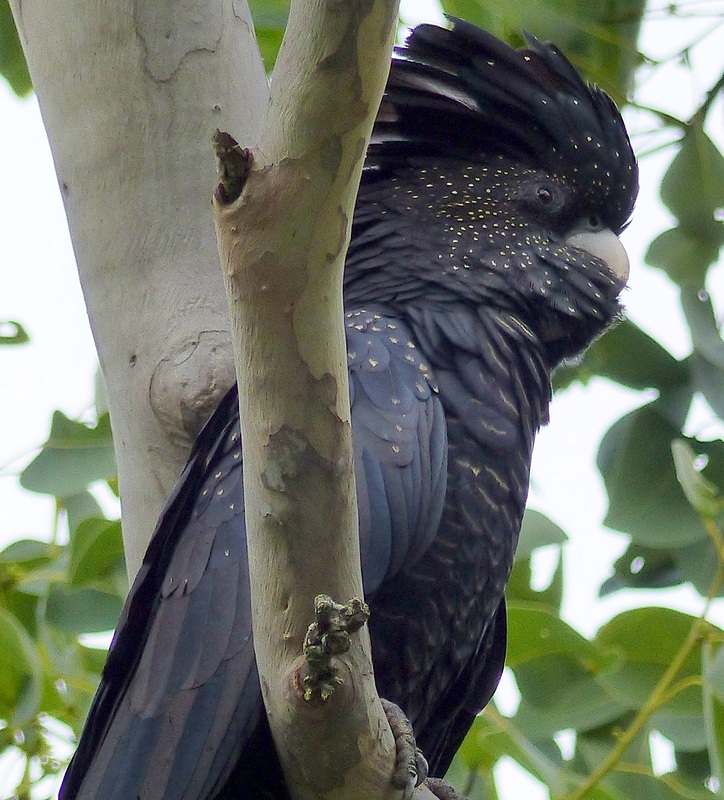 I found about 6 red rumped black cockatoos in the tree normally used by the sulphur crested white cockatoos. 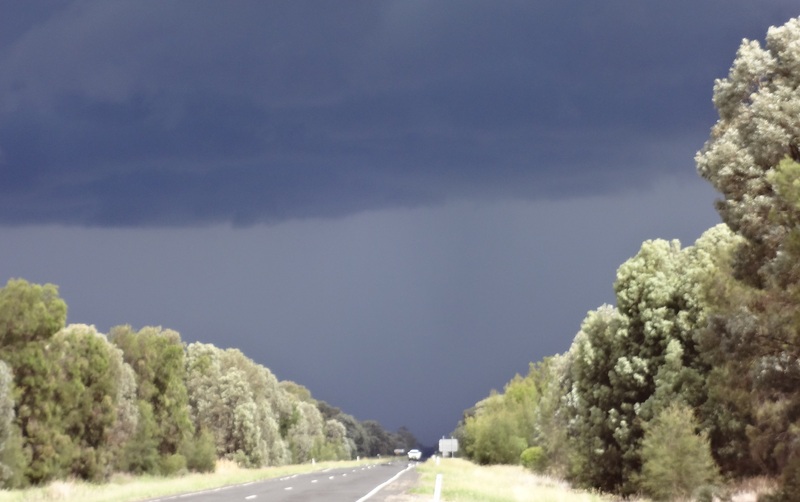 Aboriginal legend say the black cocky’s usually mean rain is on the way. Head for the hills. Hmmm! Either they are a bit late or a bit early as we have already had torrential rain this week thank you very much! I have not seen these birds in the trees in this yard before. 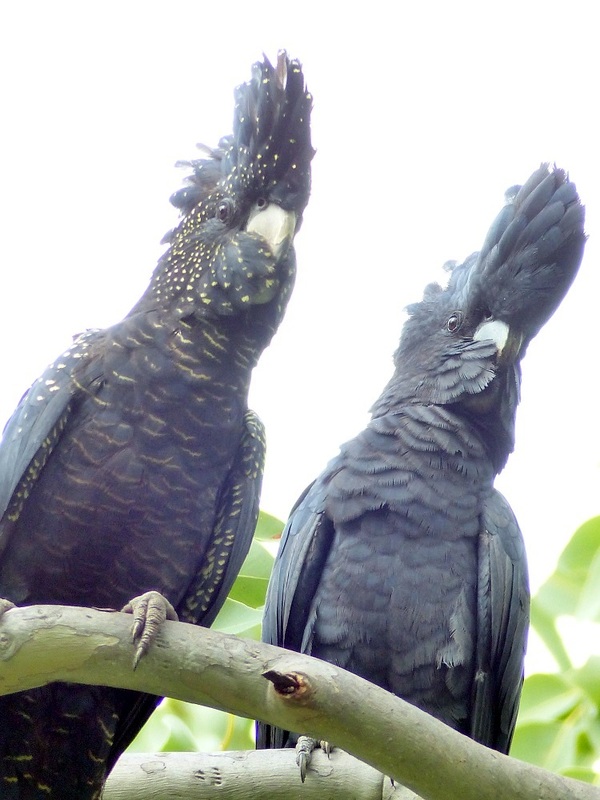 Although difficult to see, the black cockatoto on the left is a male and when he takes off in flight his under wings and tail feathers are a brilliant red with bands of yellow. Yellow bands and speckles cover the body up to and including the face. This male looks like the evil Sheriff in a Robin Hood movie, all cloaked in black. Donnis called to say she had read on Facebook our friend, Judy N from Dalmeny south coast of NSW is in hospital in Wollongong. We attended her 60th birthday party in Dalmeny in March 2013 so it was sad to hear she is not well. I called Jude on the mobile and she is now in Shelharbour Re-Hab Hospital recovering from a spinal fusion operation and has to learn to walk again. She is in good spirits and looking forward to going home in the next week. She hopes to be able to walk to the car and then walk into her own home. Good onya Jude. Stay strong and we hope you are home by Sunday next week. I did some cleaning and tidying around the house today. Donnis finishes her last shift at Collarenebri tonight and will start he drive home tomorrow. 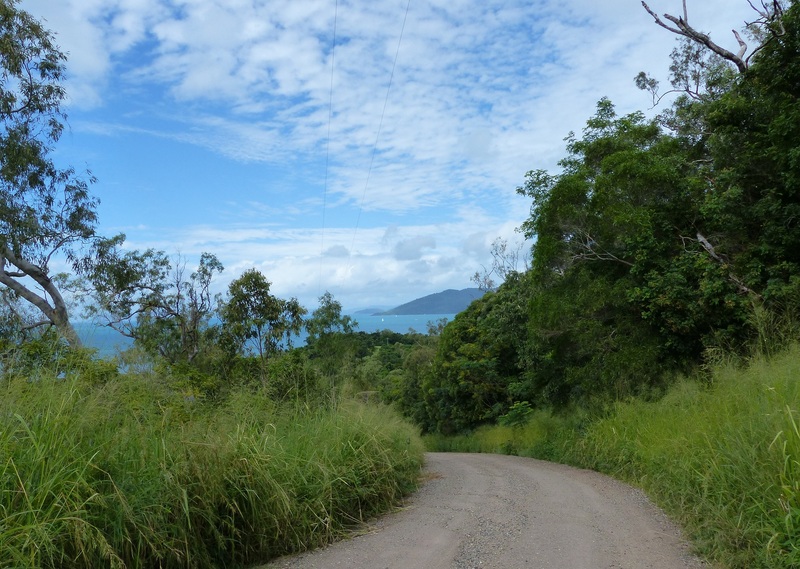 I decided to drive to Woodwark, a tiny isolated community of Airlie, mainly made up of small acreages. Some man with more money than brains has decided to build a backpacker hotel on the beach at Woodwark. 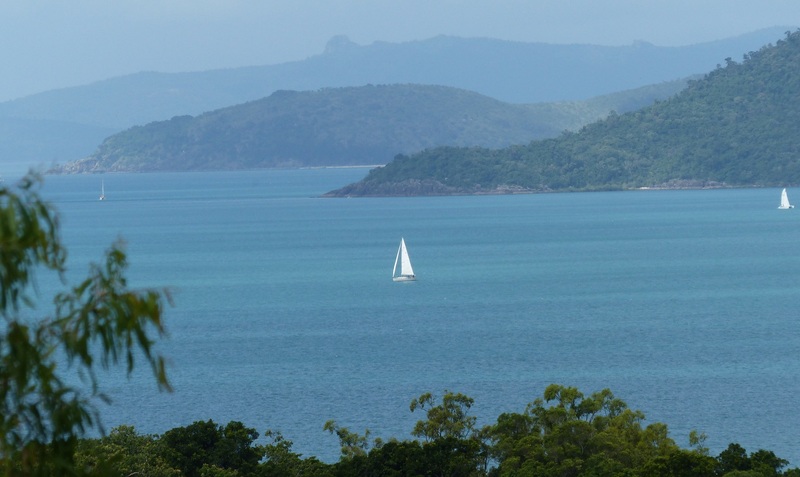 It is on the opposite side of the bay from Airlie. Yeah right. Do you detect a note of negatism in my comments? The proposed development is at the end of Pringle Road, in an area of very steep mountainous hills, populated by people who like their privacy. There is no public transport here and no footpaths and the roads are steep. Pringle Road itself degenerates into a narrow gravel road, almost overgrown with steep rutted and often washed out sections on what is little better than a track. Pringle road where it becomes gravel and drops steeply. ; Pioneer Bay is in the background. Access to the beach is barred by many signs warning you to keep out…construction in progress. Pioneer Bay seen from the top of Pringle hill. The island in the centre is North Mole and the strange shaped rock on the island in the background is on Whitsunday Island. 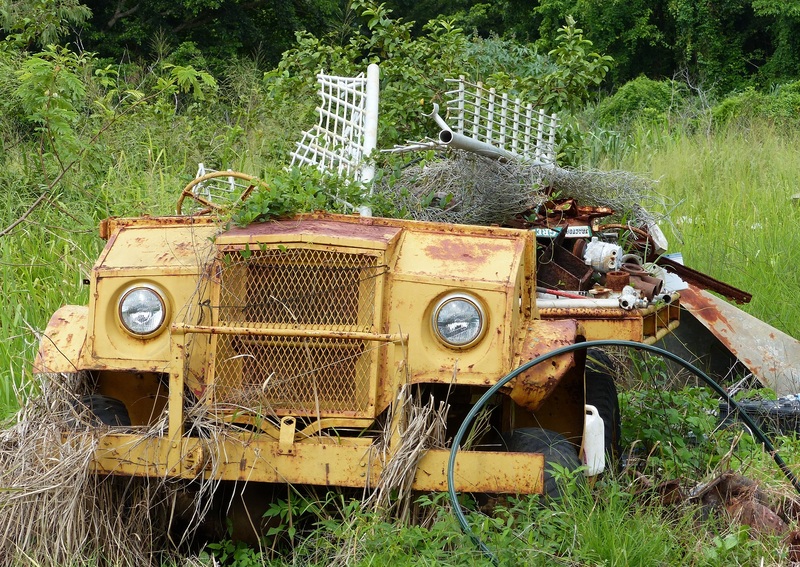 Interesting vehicle found along Paluma Road at Woodwark. On my return to the house I began the slow job of pulling down what was a temporary bamboo fence five years ago. We have an A and a B plan. A is to build a part fence or more politely a privacy screen about 6 metres long. Plan B is to plant hedge plants which will take about three years to reach 1.5metre maturity. Tonight, tonight, my love finishes her final shift tonight. Woke to rain and strong winds. In fact I was woken several times during the night. At one stage the curtains in the ensuite were being blown and flapping against the ceiling. The wind blew my toothpaste and dental floss off the shelf and the clattering woke me. At 10am the Tropical Low formed into Tropical Cyclone, Category 1,”HADI” and is slowly moving away from the coast afer doing a ”U Turn”. Perhaps to build up intensity and come back stronger. Regardless of the movements the wind and rain stayed. HADI continues its slow move away from the coast and remarkably there are three cyclonic systems in the weather map for Queensland. One is for cyclone Gillian in the Gulf country to the north, HADI off the coast and another tropical low further to the east. Still gusty wind, strong at times and rain comes and goes but as predicted, conditions started to ease today. I had a half plan of travelling to Lake Elphinstone this weekend to join the Mackay Sugarloafers. The sun came out the wind eased and I have made a decision. I will go to Lake Elphinstone in WWWGO. Hmmm! That means all the stuff I lugged off WWWGO now needs to be lugged back on. Now that I have made the decision I am looking forward to the trip. The sun shone again today but rain is forecast for tomorrow. about 260 Klms from home, 92 klms from Mackay and 25 Klms to the nearest town, Glenden, which was built by the Newlands Coal Company. 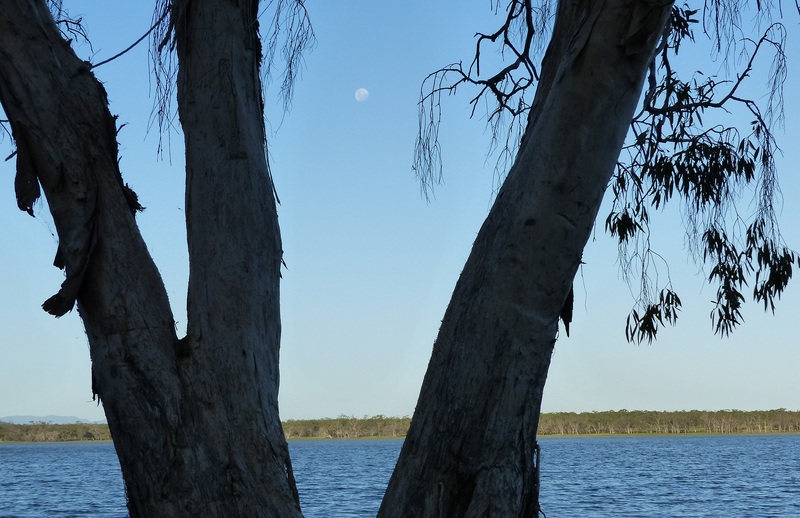 Lake Elphinstone lies within the Bowen Basin a huge area of coal deposits. Once a town, Elphinstone, comprised 9 streets was mapped out but little remains except some straight lines in an otherwise chaotic landscape. I can find no records of an actual township being built apart from being a location on a map. On arrival I found the Sugarloafers and set up camp among the other rigs. Apart from the nine vehicles belonging top Sugarloafers members there were probably another 20 or so caravans and tents scattered along the edge of the lake. Mostly people with ski boats. 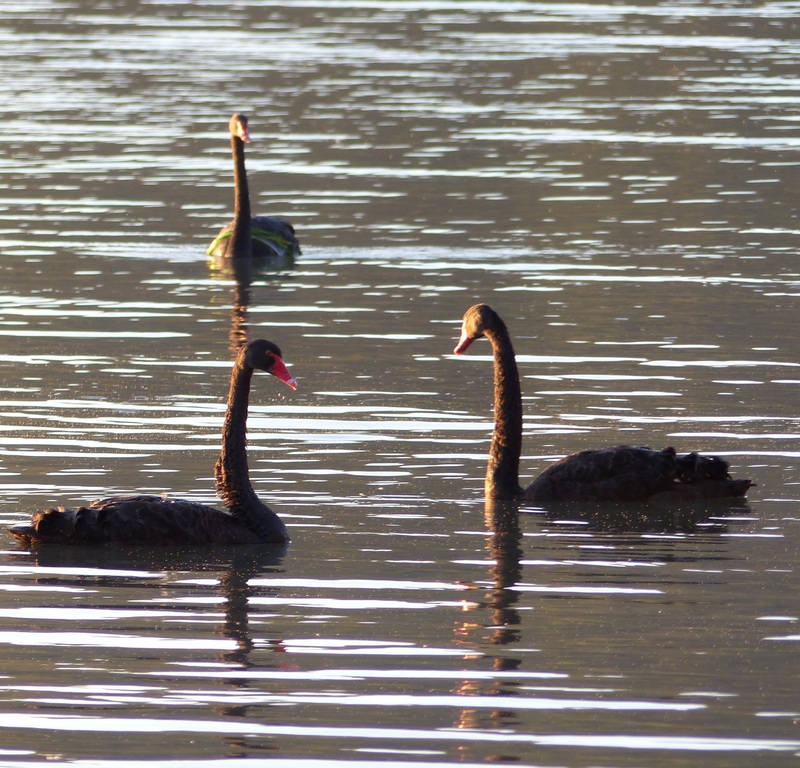 The lake is very attractive with many species of aquatic bird life. Redclaw, a much sought after crustacean of the lobster or maron family. 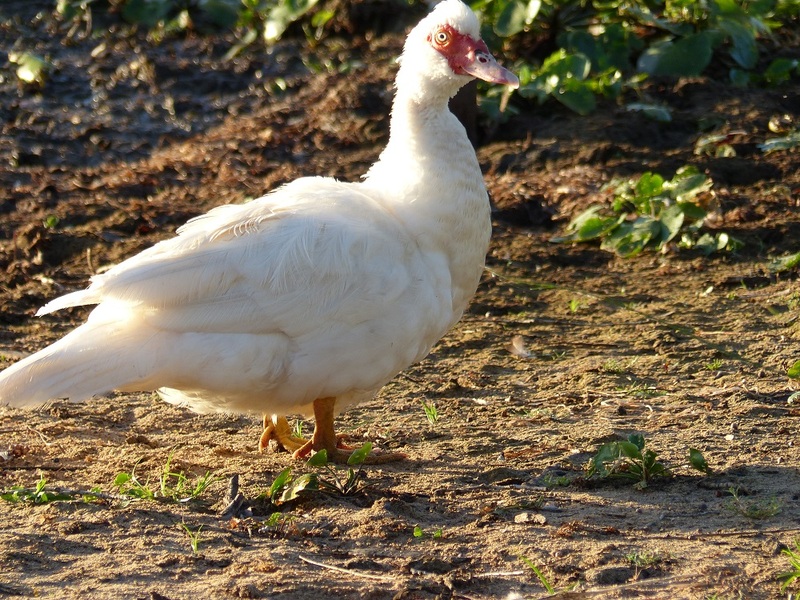 They are a good eating fresh water maron although it does take several to provide va feed for one person. Several rum and ginger beer (Dark and Stormy) at happy hour and with dinner relaxed me to the point I was falling asleep by 8.30. Calm and serene…much of the time. It is however a popular spot for ski boats and jet ski’s. High rocky hills overlook the lake on the western side of the lake. Yep,. 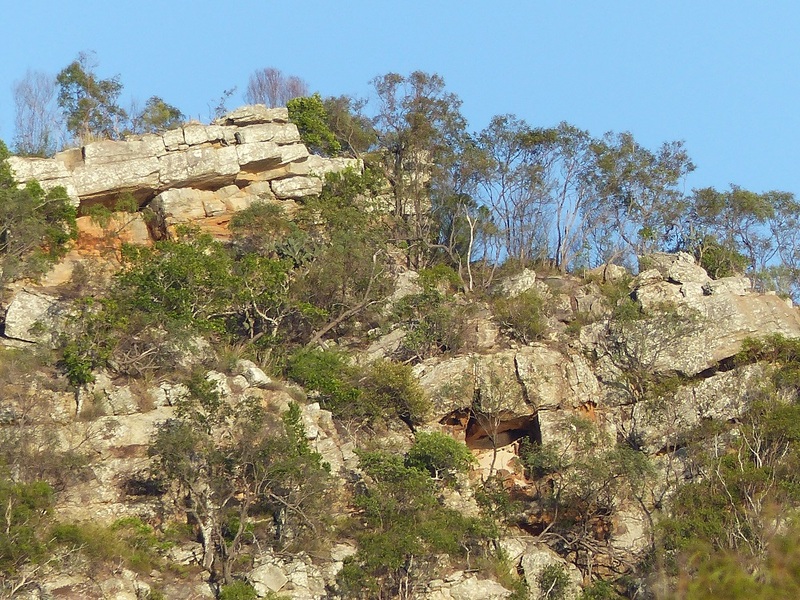 The hills are rocky with lots of balancing rocks and cave like crevises. I did some walking and talking and relaxing and drinking beer and rum and eating and talking and catching up with old friends and did I mention talking? The weather was perfect as was the night. Another Sugarloafer. John Silver and I wanted to climb the nearby high rocky hillside but realised it would be long taxing walk especially as we could not see an obvious track nor a way past the barbed wire fence. If we can find a starting point we would have to begin our walk at first light. Tonight was a communal dinner of finger food but we all called it a night by 8.30. The moon rises over Lake Elphinstone. A golden morning at Lake Elphinstone. First light at 6am and John was still asleep. I started walking to find a starting point for our possible walk (climb) to the top of this steep and rocky slope. We have been told some campers did climb the hill in recent years but we have no idea who they were or when they climbed the hill or even where their starting point was. John and I will have to do some more research before we tackle this project later in the year. 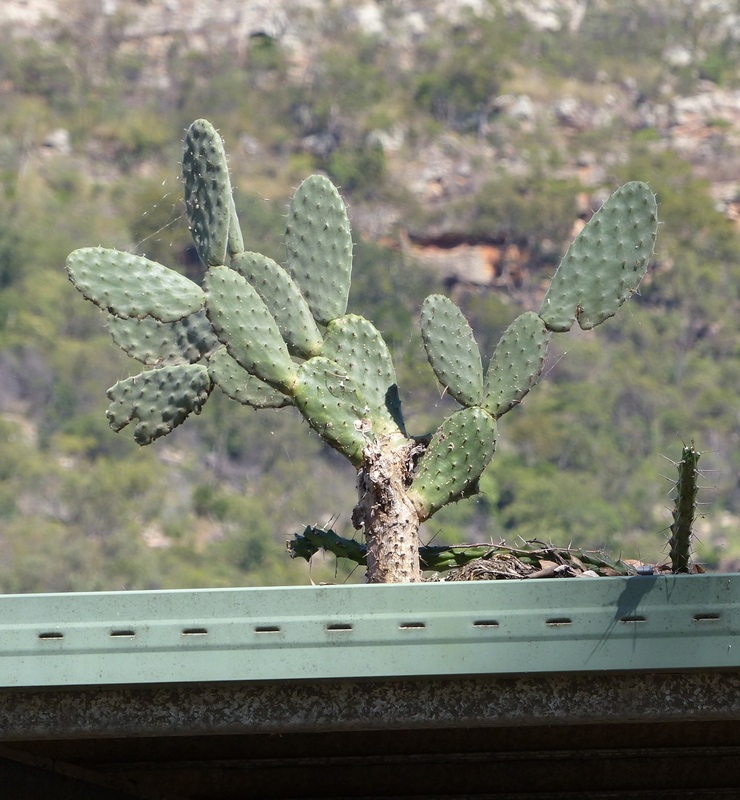 These declared noxious weeds, the Prickly Pear, can grow anywhere. It will not be long before the weight of the plant will collapse the guttering on this building. At smoko time we had a club meeting and I was packed on my way home by 11am. Only two days at Lake Elphinstone but I enjoyed it immensely. 362. Sunday 9th March 2014. WOT THE!!! Not another cyclone!!! At first light each day a herd of Laughing Kookaburra’s arrive and settle in the trees around the house and proceed to have a comedy festival and laugh themselves silly until I wake. In the evening, at last light they come back and give en encore performance of raucous laughter at some joke only they seem to understand. OMG! March already! It only seems yesterday we arrived for a visit and I was offered work and we moved into Flametree and then Donnis was offered a contract at Collarenebri and she is now 1600 Klms away. It has been 4 months since we arrived. The rain is back today after a fine hot weekend. 2005. During this month we bought our first motorhome, a converted Toyota Coaster Bus. At the same time we had a holiday in New Zealand. 2006. March was a wet month and in fact we did not go anywhere of significance. 2007. This month we did much the same as we did the year before. It was a busy time of year at work. 2008. After surviving a cyclone in February we went, with our club, The Mackay Sugarloafers, to a Country Music Festival at Finch Hatton. Of course we stayed in our Coaster Motorhome and visited daughter Melissa who lives nearby. 2009. We got married last month, survived the fringes of cyclone HAMISH and began our three month trip to Tasmania. 2010. The usual heavy rain, heat and humidity for this time of year. Donnis arrives home from three months in Canada, Cyclone Ului bashes us with a direct hit including trees falling on the house and garage roof. After a post cyclone cleanup we do “nuffin;” Just relax. 2011. 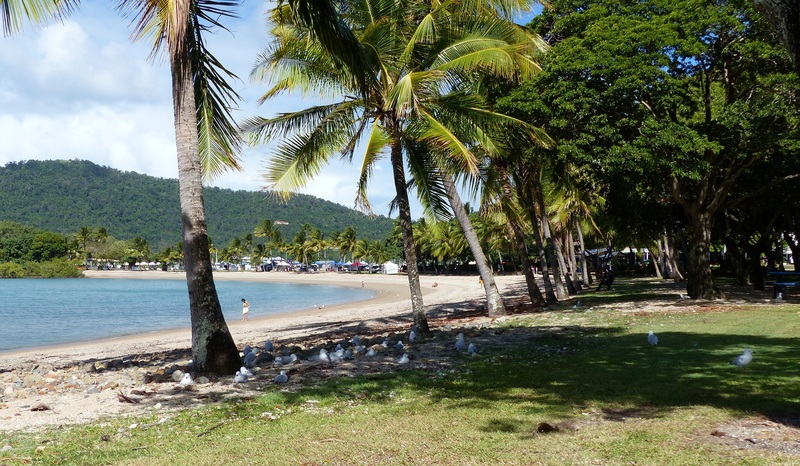 I have retired and we started on our big trip – theoretically around OZ – but we took on a three month housesit at Traveston on the Sunshine coast and while Donnis is in Canada, I explore the Sunshine Coast. 2012. 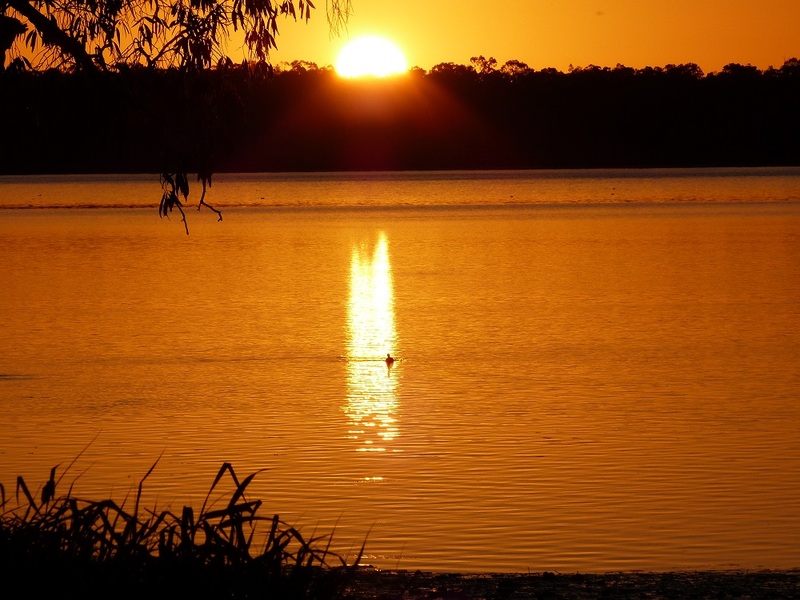 We are in Culcairn NSW not far from Wagga Wagga, Albury and the Murray River. We explore much of the area along the Murray River, the NSW Alps and experience a flood which created havoc for many people. 2013. Donnis arrives home from Canada and we leave the housesit at Guyra where I have been since November. We travel to the coast and visit family and friends in Sydney and Wollongong then continue along the south coast as far as Bega. We then turn around head north again stopping in Sydney to enjoy the Sydney Royal Easter Show. A first for Donnis and a first in 40 years for me. 2014. This month will unfold week by week with as yet unkown events. 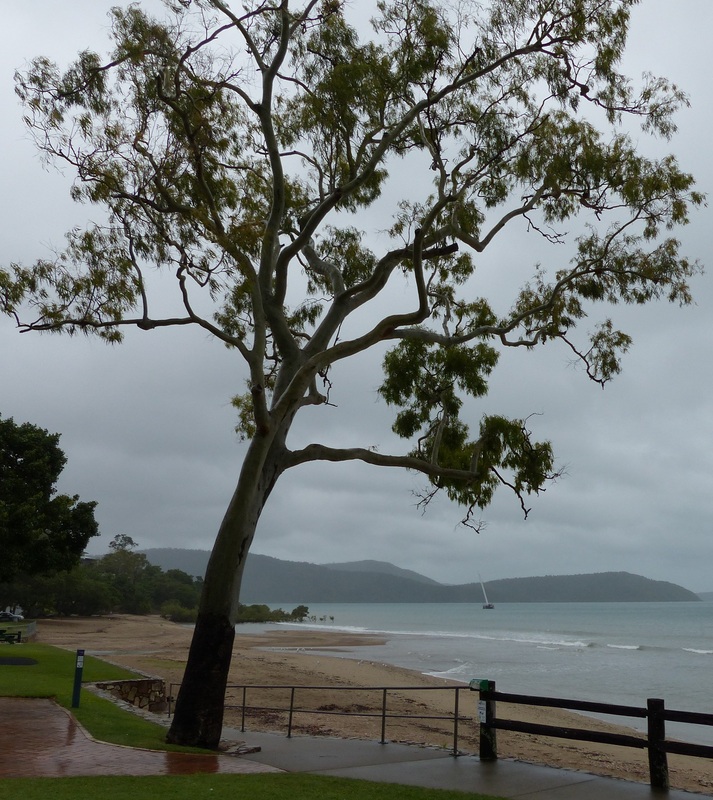 Can you believe there is another Tropical Low in the Coral Sea north east of Cairns? It is expected to form into a Tropical Cyclone by the weekend and travel down the coast before crossing somewhere to the south of Cairns. Oh golly golly. We are south of Cairns. I am facing a possible 2nd cyclone this year. Hmmm! That’s taken care of pages 1 to 15, only 185 pages to read and understand! 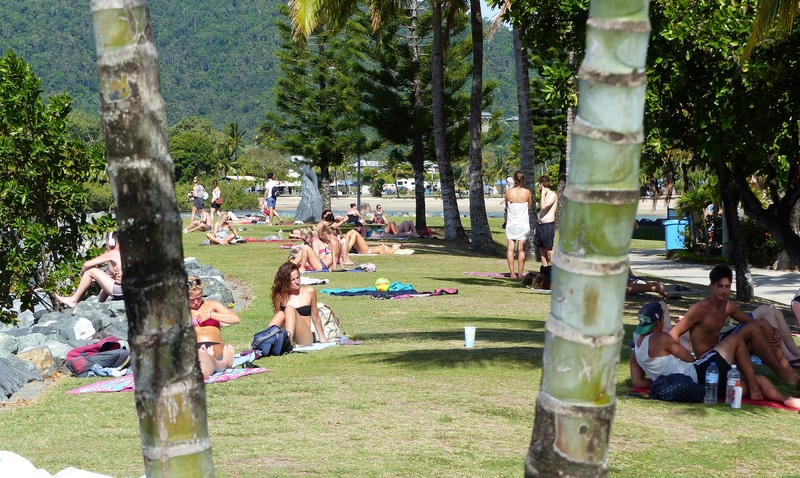 …that’s because all the backpackers and sunbathers and watchers, and appreciators oh and swimmers are at the lagoon. Fresh clean water no stingers, sharks or crocodiles, lots of grass to sit or lie upon and close to toilets showers and shops. Not only that but it is free! Another cruise ship is parked in the bay off Airlie Beach. This one is impressive and with my new FZ200 it was time to take a few photographs. My old (now damaged) FZ50 had a 10 times zoom. This new camera is smaller but packs more features and has a 24 times zoom. In the photo you can clearly read the name of the ship. 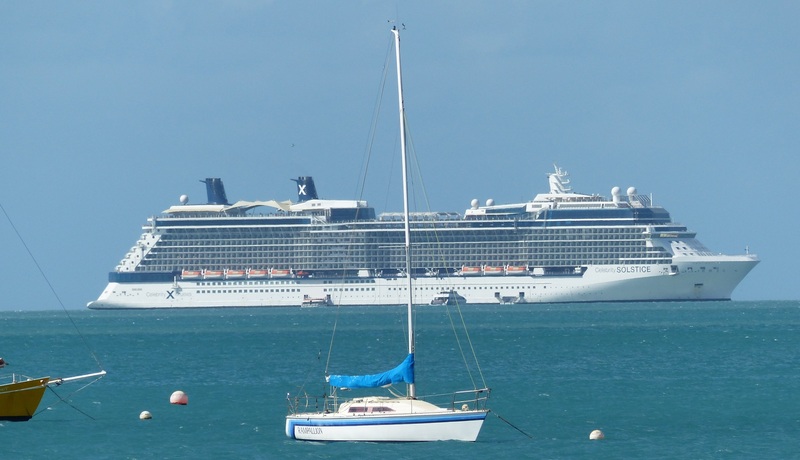 (Celebrity X Cruises – Celebrity Solstice) Even magnifying old photos of cruise ships I could find the name let alone read it. Yet another cruise ship is parked out in the bay. With my new camera with 24 times zoom you can easily read the name of the ship. We are now in a “Cyclone Watch” phase. That means to expect a cyclone to form over the next few days and prepare for strong gale force winds and lots of drenching flooding rain and possible tidal surges. I managed to get a couple of loads of washing hung on the verandah and it all dried except for the socks. It has been gusty winds and showers all day. The tropical low is still just a low but will turn into a cyclone by Saturday or Sunday and cross the coast, somewhere south of Cairns on Monday. I made another two flyscreens but it is time to pack things away in the garage. Tomorrow and Sunday will be interesting as the wind picks up and the rain …real heavy rain…begins. The official tracking map now shows the path of the cyclone, when it forms, will cross the coast between Bowen and Airlie Beach. I drove to Mackay to have lunch with daughter Avery. It is her birthday on Wednesday and I may not have another chance next week. With a cyclone threatening and predicted heavy rains to begin this afternoon, I planned a trip to have lunch and then drive home again. 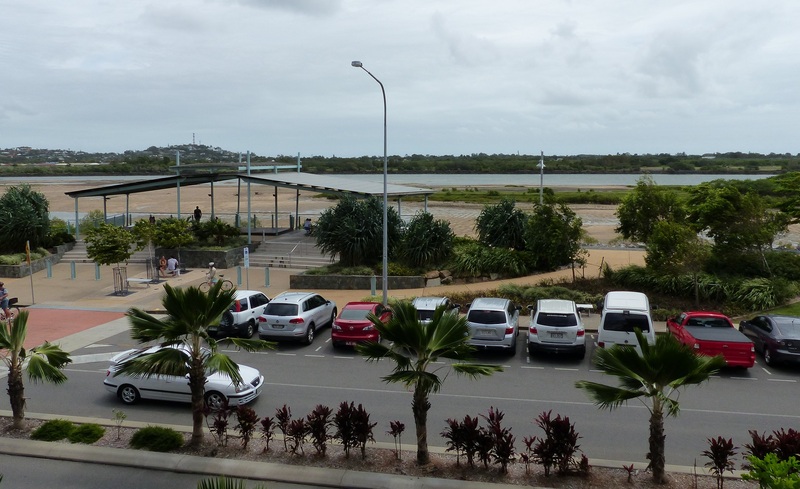 Mackay, a tropical river city which is also on the coast was sunny with gusty winds. No sign of rain clouds. The Canelands Shopping Centre was built beside the mangroves bordering the Pioneer River. 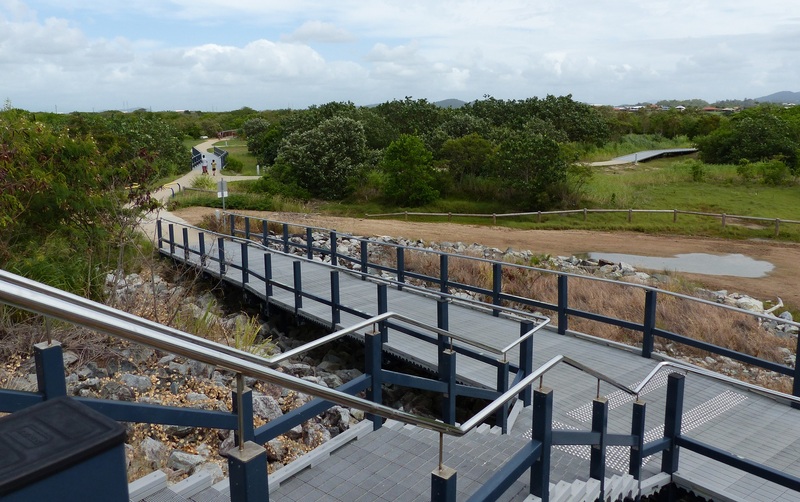 After the most recent extensions were completed in 2011 a set of walkways, bicycle trails, rest areas, picnic spots, river overlooks and parklands were built across the street from the shopping centre with views and walks beside the river. 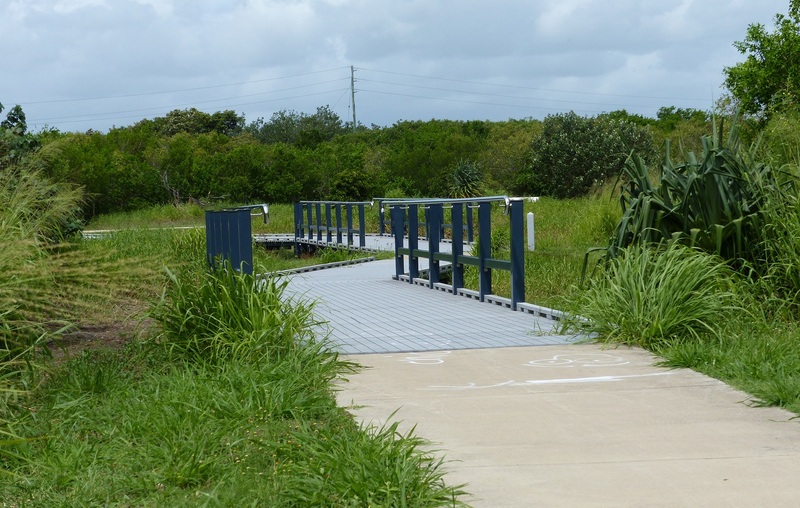 One of several stairways and entrances to the pathnways and cycle tracks through the mangroves and tidal grasslands beside the Pioneer River. At extreme high tide this bridges and pathways are underwater. Riverside entrance tio Canelands Shopping Centre. Looking across at the picnic shelter and overlook nof the Pioneer River as viewded from the outside deck area of the shopping centre food hall. This was my first chance to have a quick walk along one of the paths and appreciate the planning and work which h went into improving this once inaccessible part of the river. The family and I enjoyed lunch at the Mt.Pleasant Tavern then back to Averyl’s where Paul’s parents, Pam and Jerry, had just arrived in their motorhome from Bundaberg. After an hour of relaxation I headed home and did not encounter rain until about 15 Klms from home. Rain and strong gusty winds all night. Cannonvale Beach with the wreck of Whitsunday Magic. 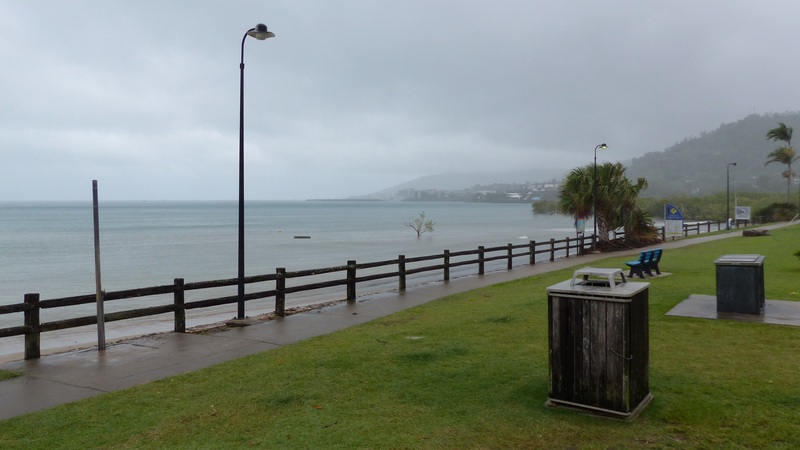 Rain rain rain looking from Cannonvale Beach to Abel Point Marina. Still no cyclone but the low is sitting off the coast and predicted to head north tomorrow before moving back closer to the coast between Bowen and Airlie Beach. Strong winds and rain all day. There is really nothing more to report except the Tropical Low is sitting just off the coast and strong winds have whipped through the trees with driving rain all day. As well the temperature has dropped. I am wearing winter bed socks which I have not worn since the cold of Guyra last February. I am also wearing a winter gown around the house and last night had a blanket on the bed. We will know more about the cyclone when it happens. …all fixed one way or another!!! Ob la dee, ob la dah, Life goes on. Work gets in the way of doing other stuff. It took me 12 months after retiring from work to shake off the mantle of concern, worry, timetables and stress. It took me less than a month to take on that mantle again. Grrr! The blankety blank blank space bar key on the laptop has stopped working. WhenItypethereisnospacesbetweentheletters!!! OK OK enough of this broken keyboard so I bought a cheap Microsoft external keyboard which plugs into a USB port. It was a cheaper option than finding a repair place and waiting a week or ten days and handing over a couple of hundred $$$ to fix the problem. I was so pleased with having a space bar key I was able to go on-line and research a replacement camera. Basically I have been happy with my Panasonic FZ50 and with my earlier Panasonic NV-DCF7so I feel comfortable moving up to the new Panasonic FZ200. The last day of the working week for me. Since moving into the house I discovered that almost every fly screen frame is damaged and or the fly screen deteriorated in the sun. Tomorrow I start making all new fly screens for the house. Hmmm! That seems like work to me! Happy Anniversay to Donnis and I. Today I started making the first of the replacement fly screens. The profile of the replacement screen frame is different to the original. It is bigger and has a 6mm spline channel whilst the original has a 4mm spline channel. Despite the setback I managed to make two complete insect screens and install them in the windows. I can now buy some extra frame material and complete the remaining windows. On closer inspection I can see ALL the windows have damaged screens some of the damage is minor but I may have enough undamaged frame parts to make one or two smaller window screens. After much grunting, sweating and wearing out the muscles of my right arm, the 4 stroke mower burst into life and purred ready for action. Similarly the whipper snipper needed just as much coaxing until it too started and stopped on command. Wow! These 4 stroke engines have not been running since August 2010. I thought I may have to pull them apart and at the very least install new spark plugs. Nope! Both worked as they orta and I managed to cut the grass in the front yard. That was enough in the scorching sunlight and I let the machines have a rest ( as didI) for the remainder of the afternoon. I know my body – especially my right arm – will be paying for the exertion tomorrow and the day after that. I am in no hurry but it did bring home loud and clear one important fact. I do not want to be cutting the grass at our next home, wherever and whenever that might be. Anybody want to buy a used but in good working condition, a 4 stroke mower, a 4 stroke whipper snipper, an electrical leaf blower/vacuum, hedge trimmer and chainsaw? I treated myself to a dinner out at the Jubilee Tavern tonight. With a glass of wine I silently toasted Happy Anniversary to Donnis while she was in Walgett, western New South Wales and silently toasted me albeit with a beer. I managed to cut the grass in the backyard and put the mower away for a few weeks. The whipper snipper was recalcitrant and would not start at all. After buying more frame material I made another screen but called a halt for today. OK. I am happy with progress with three screens made and fitted. Only 6 to go. I should have my new FZ200 by mid week and after reading the book will be out and about.